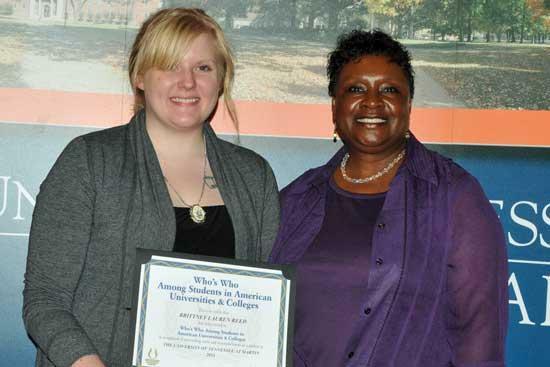 Brittney Reed, of Woodbury, recently received the Who’s Who Among Students in American Universities and Colleges Award at the annual University of Tennessee at Martin Who’s Who Award Ceremony. The Who’s Who Award is one of the most prestigious honors given to students who have proven strength and character in academic achievement, co-curricular activities and community service. The award process was established in 1934 and is conferred by more than 1,900 schools in all 50 states and the District of Columbia. Pictured with Reed is Dr. Margaret Toston, vice chancellor for student affairs. Congradulations Brittney!!! I am sure your parents and community are very proud of your accomplishments!! !You are a fine example for all the seniors at CCHS sho are getting ready to graduate and enter the world!! !